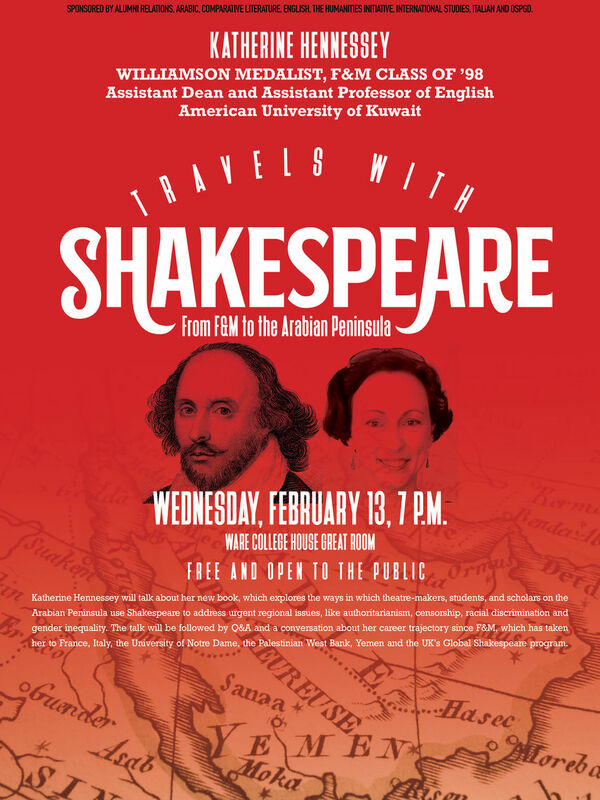 Katherine Hennessey ’98, assistant dean and assistant professor of English at the American University in Kuwait, will appear at Franklin & Marshall College Feb. 13 to discuss Shakespeare’s influence on the Arabian Peninsula. F&M’s 1998 Williamson Medalist, Hennessey is the author of the 2018 book, “Shakespeare on the Arabian Peninsula,” and director of the short documentary, “Shakespeare in Yemen,” screened last June at New York City’s Signature Theatre. Hennessey was recently awarded a fellowship by the National Endowment for the Humanities that will help support her next project, “Theatre on the Arabian Peninsula.” She will explore the ways in which theatre writers, producers, students and scholars on the peninsula use Shakespeare to address such regional issues as authoritarianism, censorship, racial discrimination and gender inequality. A conversation with F&M students and one of her former professors, Scott Lerner, Arthur and Katherine Shadek Professor of Humanities and French and Italian, will follow her talk. Hennessey will discuss her career trajectory, which has taken her from F&M to France, Italy, the University of Notre Dame, the Palestinian West Bank, Yemen and the United Kingdom's Global Shakespeare program. The audience also will have an opportunity to ask questions. Hennessey’s discussion, "Travels with Shakespeare: From F&M to the Arabian Peninsula," begins at 7 p.m. in the Ware College House Great Room.